that wont help i guess… because i tried it dsnt works… kernel reinit with same environment, only workaround i could find is using old image of python docker but it takes long time to load it whenever kernel reinitializes. Could you share how you loaded an older python docker image…? How long was a long time … for the kernel to reinitialize…? They were great… I was able to run them in one form or the other till last week, Today the imports fail, I did try the work around you shared in the lost above… that didn’t work. I think a lot of other users have been facing similar issues, with posts as recent as 15 hours [as of this posting] querying about it. Any ideas/workaround for this issue…? 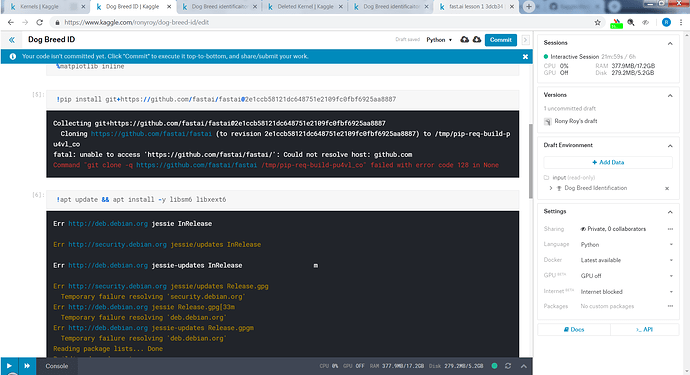 if you had ever used fai 0.4 in kaggle kernel,then in Docker drop down there should be an old snapshot of python docker available select the one prior to update of FAI version. If your kernel is new then you will not have any snap shot. Only workaround is include pip install fai 0.7 in very first block . It dint work for earlier now it works,but then every time u open the kernel u need to run the block. should i be worried that these files are moved to a path with ‘old’ in it…? …?